IDF: security forces entered neighborhood to carry out an arrest, and were attacked with "extreme violence" by hundreds of Arabs. Arab sources said Monday morning that three rioters were shot dead in Kalandiya, north of Jerusalem, in a clash with the IDF, and 19 were wounded. An initial IDF inquiry shows that Border Police were attacked with fire bombs, rocks and bottles, and had to resort to live fire. The IDF said Monday that the incident took place during nighttime activity by security forces for the arrest of a wanted man in Kalandiya. In the course of the arrest, “an extremely violent disturbance” developed, and “many hundreds” of Arabs attacked the IDF force. The IDF force that was providing security for the arresting squad took action to extricate it, and when the forces felt actual danger to their lives, they opened fire at the attackers. The wanted man, a terrorist, was arrested and taken to interrogation. 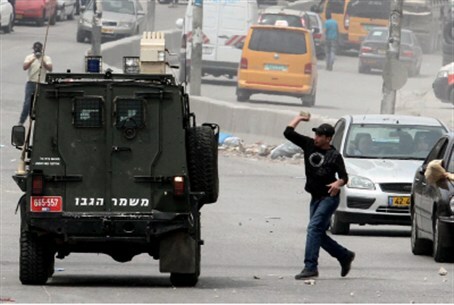 AFP said that three Arabs were transferred to a hospital in Ramallah, where they were pronounced dead. Arab hospital officials told AFP the dead were Rubeen Abed Fares, 30, and Yunis Jahjouh, 22, who were both shot in the chest, and Jihad Aslan, 20, who died of brain damage. "In the early hours of the morning a border police team went into Kalandiya camp to arrest a hostile terrorist activist," Israel Police spokeswoman Luba Samri said. “After his arrest, a mob of about 1,500 residents began a disturbance, throwing fire bombs and stones, endangering the lives of force members, who responded with riot dispersal means." "We do not know of any fatalities on the other side," she added. "We know of three injured who were taken to a (Palestinian) hospital but we do not know of danger to their lives." She said that three border policeman were lightly injured by rocks.